As noted in part one, Bailey’s words were channeled through her by a demon known variously as “Djwhal Khul”, “the Tibetan”, or “Master D. K.”. Bailey was essentially a disciple of H. P. Blavatsky, one of the founders of Theosophy. Formed in 1875, Theosophy itself is an amalgamation (uniting) of occult doctrines with some roots in 1st/2ndcentury Gnosticism. These Theosophical teachings form much of the basis of the New Age / New Spirituality. Parousia is defined: “arrival as the first stage in presence, coming, advent”. (40) By the complete context it’s clear that once the ‘lawless one’ is revealed there will be “all kinds of [false, counterfeit (pseudos)] miracles, signs and wonders”. These will be absolutely real, but they will be false in the sense that they are coming from Satan. Ultimately, the power comes from God as He allows Satan the use of this power for His own purposes (v 11). De Purucker may seem a bit confusing here (and his run-on sentences do not help in clarifying); but, what he’s stating is that in the doctrine of reincarnation all spirits are part of the one “god” who is within all things – a doctrine known as panentheism. These spirits are immortal, eternal. De Purucker differentiates between spirit and “soul” with the latter referring to any vehicle containing the spirit. Each entity has its own “soul”. That is, the descending spirit has its own “soul”, its vehicle, which enables it to descend and it, in turn, inhabits the soul/vehicle of the human body. (48) Besant above is speaking of the soul as vehicle containing this immortal spirit which is “awaiting the opportunity of incarnation”. According to this occult doctrine, the human being can function without acknowledging this descended spirit; however, once one acknowledges the ‘god spirit’ inside, one can begin the path to “godhood”. Esoteric/occult/New Age literature has long proof-texted Colossians 1:27, “Christ in you, the hope of glory” to indicate the god within which needs to be first realized then actualized. As but one example of Alice Bailey, “There is a growing and developing belief that Christ is in us, as He was in the Master Jesus…” (53) Here Jones seemingly has yet another application in mind. Is he speaking of the fake parousia, the false second coming of which both the Apostle Paul and Alice Bailey spoke? – He clearly borrows from Word of Faith (WoF) theology. As stated in a previous article, some of his doctrines follow Kenneth E. Hagin, Sr. in the way he moves from one Biblical proof-text to the next to make his theological points. One such example is the ‘born again Jesus’ teaching in which he moves from Hebrews 1:4-5 to Acts 13:33 although Johnson stops short of Hagin’s claim that Jesus went to hell, took on Satan’s nature and was subsequently ‘born again’. – Johnson has friends who have propounded and continue to promote unorthodox and heretical doctrines including Bob Jones (as noted in the previous section), Todd Bentley and others. Conferences of which Johnson both hosts and speaks feature individuals with unbiblical and anti-biblical doctrines and some with questionable practices. He specifically backed Todd Bentley both at the Lakeland “Revival” and in its aftermath, and he even wrote a letter last year in support of him recommending him for ‘ministry’. – Johnson promotes contradicting concepts. Johnson states one thing one time then contradicts this very thing the next. One example is his definitive statement, “sin and its nature have been yanked out by its roots”. (70) This, of course, is not Biblical as we never get rid of our sin nature until we receive our imperishable bodies [1 Cor 15] at the resurrection of the saints. Johnson will make statements seemingly affirming our ability to remain sinless (71) (a view in common with New Age / New Spirituality) yet, at other times Johnson will make statements about our sin. (72) In addition, Johnson’s followers sometimes understand his teachings in an unorthodox manner while Johnson rarely makes any attempts to correct these ‘misunderstandings’. Each of these suggests not ‘merely’ kenosis but metamorphosis instead, i.e. the Word literally became a man transforming Himself into a human devoid of any deity/divinity. (76) Perhaps Johnson was not very careful with his words (and Charisma as well as Chosen Books, the publisher of his book, were equally careless in editing); however, when taken together with the other two statements above and the rest of his Christological statements, something is definitely amiss. This reconfirms the analysis of Johnson’s Christology in part I. Moreover, in looking over all the other evidence noted in this section one may wonder if he is not deliberately making these seemingly confusing and contradictory statements. Keeping in mind the goal as specified by Alice Bailey in part I of this article in “ preserving the outer appearance in order to reach the many who are accustomed to church usages”, (80) the kenosis/metamorphosis teachings may be a way to ‘Christianize’ the concept of reincarnation, i.e. by superimposing this on the subject of the person of Christ in a way that seemingly remains ‘Christian’. …And the whole issue of Jesus going to the Father was that He would be going as the Resurrected, Ascended, glorified Son of God, and, in that condition would set the stage for what you and I would become. It’s an amazing part of the Gospel. Did you know that Jesus gave up everything to become a man? He owned everything. He and His Father owned everything…But when Hebecame a man – He forfeited everything to become a man. One of the most amazing truths in the Bible…in John 16 is that Jesus re-inherited everything…He’s talking to His disciples…‘The Father’s given me everything.’ Now think about this. He gave it all up;He forfeited His right to everything to take on a human body and be murdered to take upon Himself what you and I deserve so that we could take upon ourselves what only He deserves. Stunning. Part IIIa will take specific quotes of Bill Johnson and compare these to various quotes from New Age material. In addition, Part IIIb we’ll take a closer look at the “spiritual DNA” teaching and will discuss “the Word made flesh”. All this should prove quite ‘illuminating’. (39) Bailey, Externalisation; p 510. Emphasis added. (40) Bauer, Walter, F. W. Danker, W. F. Arndt, F. W. Gingrich A Greek-English Lexicon of the New Testament and Other Early Christian Literature. 2000 (3rd ed. ),University of Chicago Press, Chicago, IL; pp 780-781. Also known as “BDAG”. (41) Fox, Matthew The Coming of the Cosmic Christ: The Healing of Mother Earth and the Birth of a Global Renaissance. © 1988 by Matthew Fox, Harper Collins, New York, NY; p 65. Bold from emphasis in original; underscore added. (42) Jones, Bob “The Coming Kingdom” Piercing the Darkness Prophetic Conference, February 2011. Hosted by Bethel Church, Redding, CA, Feb 23-25, 2011, Session 4, Feb 24, 2011, 7:00pm; 16:02 – 16:05. 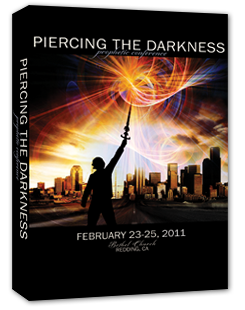 Available for sale at Bill Johnson’s Bethel Church website: <http://store.ibethel.org/p4810/piercing-the-darkness-february-2011-complete-set-bethel-campus> As accessed 04/01/12. (43) Jones, “Coming Kingdom”; 11:30 – 11:59. Emphasis added. (45) Jones, “Coming Kingdom”; 24:36 – 25:30. Emphasis added. (46) Besant, Annie The Ancient Wisdom: An Outline of the Theosophical Teachings. © 1939 The Theosophical Publishing House, Adyar, (1897; 8th Adyar ed 1969), Adyar, Madras, India; p 214. Book is “dedicated with gratitude, reverence, and love to H. P. Blavatsky who showed me the light”. While there are a few minor discrepancies in the teachings of Blavatsky, Besant and Bailey, they mostly agree. (47) de Purucker; p 157. Bold from emphasis in original; underscore added. (48) de Purucker; p 154. “…What do we mean by soul as contrasted with spirit? We speak of the human soul and the spiritual soul, and we speak of the astral soul, and we speak of the animal soul. But we do not use those terms in connection with the word spirit. Does it not teach us that the meaning of soul is that of a vehicle, an uphadhi in general; that vehicle, or any vehicle, in which the monad [ED: spirit, i.e. part of the transcendent “God”], in any sphere of manifestation, is working out its destiny?” [Emphasis in original.] In this doctrine of reincarnation, everything has a “soul” – minerals, plants, animals and humans – and each have an inhabiting “spirit” which is using the “soul” as a vehicle to ascend to godhood. The mineral must first ascend its way to the plant, then the animal, then the human, and ultimately to godhood. (50) Jones, “Coming Kingdom”; 21:26 – 21:40. Emphasis added. (51) Jones, “Coming Kingdom”; 38:53 – 39:05. Emphasis in original. (53) Bailey, Externalisation; p 592. Emphasis in original. (54) Paulk, Earl Held in the Heavens Until…: God’s Strategy for Planet Earth. 1985, K Dimension Publishers, Atlanta, GA; p 229. All emphasis added. (56) Dubois; par 5. Continuing from above. (59) Branham, William M. The Revelation of the Seven Seals. © 1993 VGR (2009 reprint), Voice of God Recordings, Jeffersonville, IA; pp 259, 283-285, cf. 259-295. Transcribed from original tapes recorded March 17-24, 1963. (62) Liardon, Roberts God’s Generals: Why They Succeeded and Why Some Failed. © 1996 by Roberts Liardon (2nd prtng), Albury Publishing, Tulsa, OK; p 340. The book is endorsed by C. Peter Wagner, Hee Kong, Jack Coe, Jr., Gerald Coates and others. (68) Johnson, Release Power of Jesus; p 107. Emphasis added. (73) Johnson, Bill. “Authority and Power for Healing, Special Impartation and Activation Service”, NW Healing Explosion – Seattle Region, held at Sonrise Christian Center, Everett, WA, Thursday, December 1, 2011 (most likely date, as it seems there’s discrepancy between schedule on bulletin and date listed on url with Johnson’s monologue), 7pm; 42:30 – 43:10. <http://www.livestream.com/nwhealingexplosionseattle11/video?clipId=pla_49e5829f-8bef-4441-a0a1-3d91097b27a2&utm_source=lslibrary&utm_medium=ui-thumb> As accessed 04/01/12. Emphasis added. Many thanks to the CrossWise reader who sent this to me recently. (74) Johnson, Bill. “You’ve Got the Power!” Charisma. March, 2012, Vol 37, No. 8; p 26. Emphasis added. Also currently available online: <http://www.charismamag.com/index.php/new-man/1622-features/32505-youve-got-the-power> Feb 23, 2012; par 7-8. As accessed 04/01/12. Many thanks to CrossWise reader/commenter Tim Bain for providing the source. (75) Johnson, Bill, Randy Clark. The Essential Guide to Healing: Equipping All Christians to Pray for the Sick. © 2011 by Bill Johnson and Randy Clark, Chosen Books (a division of Baker Publishing Group), Bloomington, MN; p 125. Emphasis added. Each chapter is authored by either Bill Johnson or Randy Clark. The chapter from which this quote is taken was authored by Johnson. (76) This is consistent with Word of Faith doctrine. (77) Fee, Gordon D. The First Epistle to the Corinthians: The New International Commentary on the New Testament. 1987, Eerdmans, Grand Rapids, MN; p 581. Emphasis added. (78) Fee, Corinthians; p 582. Emphasis added. (79) Blomberg, Craig L. The New American Commentary: Vol. 22; Matthew. 1992, B&H Publishing Group, Nashville, TN; pp 132-133. Emphasis added. (82) Johnson, Bill. Audio clip taken from 2010 Australian “When Heaven Invades Earth” Tour as accessed from Plantagenet Family Church, Mount Barker, Western Australia, 03/21/11 from the following url: <http://pfchurch.org.au/?p=357> which now is redirected to a different page altogether. Link recovered on Internet Archive / The Wayback Machine; however, audio clip is unavailable: <http://web.archive.org/web/20101106155256/http://pfchurch.org.au/?p=357>. Originally transcribed by CrossWise on 3/21/11 or just after; last access date to original web link unknown but likely Fall, 2011. All emphasis added. Many thanks to the CrossWise reader who sent this to me on 3/21/2011. (83) A similar quote is available on YouTube by “whizzpopping” Bill Johnson – Bringing Heaven to Earth (Part 2 of 2). Aug 20, 2010 <http://www.youtube.com/watch?v=CxVdxzJ0vN4> 3:10 – 4:30: “He forfeited everything because He owned everything; literally all that exists was His. And, He gave it all up to become a man; and, then He re-inherited everything as a man so that you and I would have an inheritance – the absolute mercy of God. So, now He stands after His triumphant Resurrection. The defeat of the power of death, hell and the grave – all that stuff was defeated, the power of sin. And, He stands before humanity and He says, ‘I got the keys back. That which was lost in the Garden, I’ve got it back. Now, let’s get back to plan A.’ And, he makes this profound statement; he says, “All authority has been given to me in heaven and on earth.” Jesus did not make that declaration as God. Now, na – He’s eternally God; he’s not a created being, He didn’t ascend, ya know, to some position. He’s eternally God; but, He did not make that statement as God. How do we know? Because He said, ‘All authority’s been given to me.’ There’s no one higher than God to give God authority. When Jesus made that statement, He made the statement as our elder brother.” Bold from emphasis in original; underscore added. As accessed 04/01/12. Once again, note the stammering in his disclaimer.